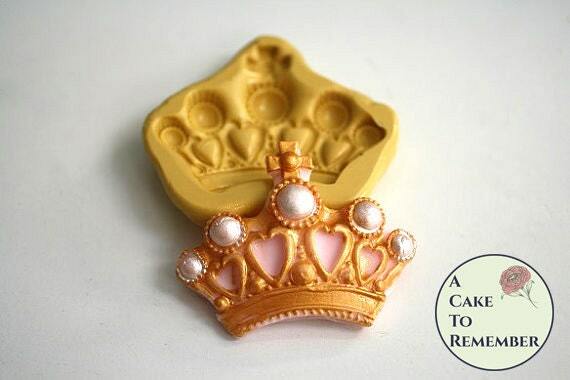 Crown silicone mold for cake decorating, cupcake decorating, chocolate, polymer clay, resin, made from food-safe silicone. The crown is about 2 1/2" wide and 2" tall at the tip. 12 precut 100 dollar bill edible money image wafer paper for cake decorating or cupcake decorations. Precut edible paper fake money. Three sizes mermaid scale soap texture mat to make a fish scale design for soapmaking, or a fondant border for dragon cake decorating. Rainbow edible butterflies, 28 assorted sizes for wedding cake or cupcake toppers. Wafer paper butterflies, cupcake butterflies, cake pops. 48 small rainbow edible butterflies, fairy party decor, 1/2"- 3/4" cake or cupcake topper, rainbow butterflies cake pop, smash cake topper.